Posted 8/14/2017 10:47pm by Jeff Schrimmer. So we begin, as always, with the weather report. We received a whopping two and a half inches of the wet stuff over a 12 hour period last Friday. Fortunately it fell mostly at night and did not rain on any of my weekend markets. Also fortunate is that we have well drained sandy soil. It was another blow to the already doomed tomato crop and I am a bit worried about the cucurbit crops (squash, melons and cukes of course). So far they look OK but we need some sun and some warmth. More rain is forecast for tonight and tomorrow; hopefully it won’t be too heavy! In addition to disease worries the wet conditions impede seeding the fall crops and make harvesting potatoes more difficult. We are temporarily out of lettuce; a result of some bolting in the field as well as a break in our succession planting due to poor germination in the greenhouse. This is fairly typical; it’s hard to grow lettuce during the dog days of summer! Hopefully in a couple of weeks I will be able to say: lettuce begin! We have more tomatoes than we can possibly pick at the moment (or fit on the truck for that matter). We will do our best to share the abundance with you. We have another nice share for you this week, in spite of the challenges Mother Nature presents. The share for this week will be: tomatoes , peppers, eggplant, summer squash, red skin potatoes, choice of kale or chard, rainbow carrots, white onions, choice of cherry tomatoes or ground cherries, beans, and either a melon or a watermelon. Premium members will receive choice of an herb and choice of tatsoi or arugula. Posted 8/7/2017 7:27pm by Jeff Schrimmer. So a couple of weeks ago I was at a training with a bunch of my fellow farmers. Some of them were discussing the wet season we are having and one said “yeah but farmers never complain” and everyone laughed. It’s true though, we only complain when it rains too much or when it doesn’t rain enough; when it’s too hot or too cold! I’m sure that some of you are tired of my griping about the rain, but who else will listen if not my members who are impacted by the weather in terms of what they receive in their shares? No matter what challenges the weather brings we roll with it and do our best to maintain the quality of the crops (and also try to maintain our sense of humor!). The bottom line is that this year is not going to be good tomato year. We have done our best but most of the crop is succumbing to blight. We will continue to have tomatoes for a few more weeks but they will not be as abundant and may not be as flavorful as the have been during many previous seasons. Enjoy them while they last! On a happier note- melon season has begun! A few late week groups got their first taste last week, but now there are enough for all. We have galia, canary, honey dew, Korean and cantaloupe as well as watermelons. We hope to provide you with a variety over the next month or so. The share for this week will be: Peppers, eggplant, Yukon gold potatoes, tatsoi, beans, summer squash, slicing tomatoes, cherry tomatoes, green cabbage, melons and garlic. Premium shares will get lettuce, leeks, beets and choice of parsley or summer savory. Posted 7/31/2017 9:24pm by Jeff Schrimmer. So the weather this past week was copacetic. Most of the rain that was forecast didn’t materialize and the cool temps were a relief from the heat. I am hopeful that the week to come will develop similarly; as it stands now rain is in the forecast every day from Wednesday until Wednesday next except for Sunday. We have been working hard to bring in the onion crop. As the top begin to die back and dry, they are susceptible to rot when condition are wet. We bring them into the barns and spread them out on racks to dry and cure. We have a tremendous crop provided we don’t lose too many. We have some nice red onions for you this week and they will be in many of the shares for the duration of the season. Next week we are planning on leeks and garlic- an allium double header. Tomatoes are ripening prolifically although many were sun scalded during the heat wave. This is a consequence of the loss of the lower leaves of the plant due to the blight caused by all the rain. We will have a few slicers for you this week, with more volume and heirlooms varieties ensuing as the summer progresses. We ran out of broccoli last week; also a result of heat and too much rain damaging much of the crop. Some groups received red cabbage instead and we will try to compensate for that in the fall. We are planting tens of thousands of broccoli for the fall as well as cauliflower and other brassicas. The share for this week will be: Carrots , peppers, red onions, summer squash, cucumbers, lettuce, Russian banana fingerling potatoes, choice of kale or chard, tomatoes, eggplant, beans or cherry tomatoes, red cabbage(unless you got it last week). Celery for premium shares. For extras there are tomatillos and hot peppers. Posted 7/25/2017 2:55pm by Jeff Schrimmer. Well it continues to rain, but at least this round brought us some relief from the heat! It looks as though the temps will be more moderate this week; the humidity not so much. So summer is officially in full swing now- the tomatoes have begun to ripen! While we won’t have enough to distribute this time around, we should by next week. What we have more of are Sungold cherry tomatoes, so some groups will receive these this week and others the next. We are also beginning a rotation with the beans, so you should get either the cherry tomatoes or the beans. Melons are beginning to ripen too, and will likely be in the shares next week. All this moisture has taken a toll on the beet tops- they get blight and turn brown. You will be receiving beautiful beets in the share but without the greens. Greens in general are scarce this time of the season. We are going to let the kale and chard rest for this week. The share for this week will be: Broccoli, peppers, eggplant, lettuce, beets, cucumbers, either beans or cherry tomatoes, red skinned potatoes, white onions, and choice of an herb (garlic chives or parsley). Premium shares will receive an extra lettuce, basil and bok choy. Posted 7/18/2017 1:59am by Jeff Schrimmer. So it continues to rain and I continue to worry; it’s an occupational hazard I guess… We got 2 inches last week and thunderstorms are rolling through as I sit down to write. I was about to head out and plant some seeds, having waited for it to cool down a bit. The rain was not really forecast until about an hour before it arrived and by the time I got to the barn where my seeding tractor is kept, the wind was kicking up and the first drops began to fall. This is another aspect of the challenges of a wet season- finding windows of opportunity to get the planting done. When the ground is too wet it can’t be worked- plowed and tilled to prepare seed beds. If the beds are too wet the mechanical seeder does not function properly. Once the beds dry the surface crusts over and they must be tilled again before planting. In Mid-May I put in a small planting of beans with the intention of planting a much larger patch a few weeks later. Unfortunately six weeks went by before I was able to plant more. The peas have petered out now and we normally have beans to replace them. We expect to have small quantities to give in rotation over the next few weeks, but it will be awhile before the beans are bountiful. That being said we have a wonderful share for you this week! I honestly don’t know how it could get much better, at least until the tomatoes and melons arrive. Rainbow carrots and fingerling potatoes! Broccoli and Cauliflower! Whoo-hoo! 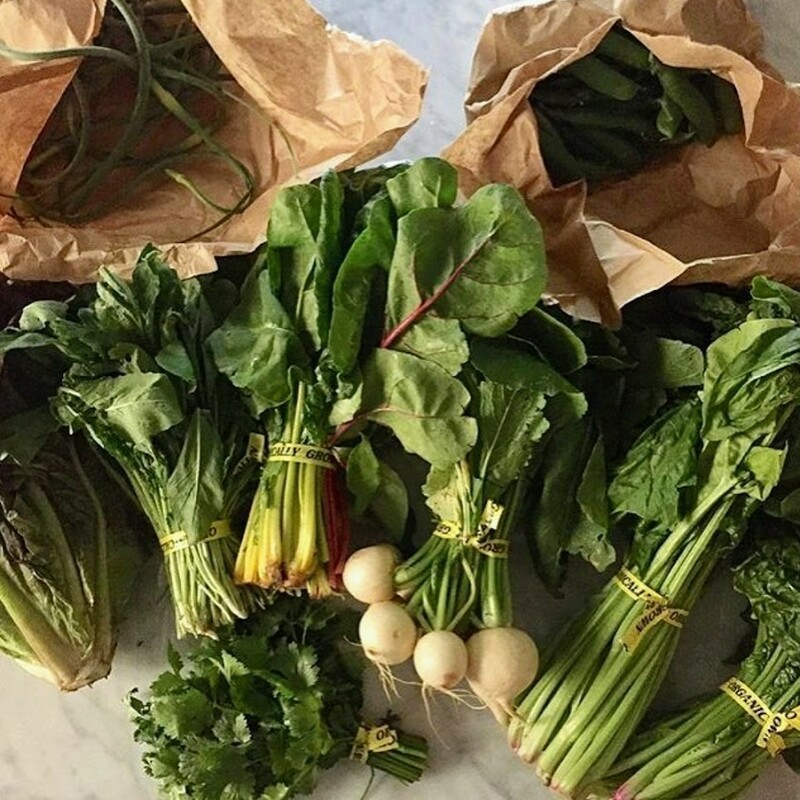 The share for this week will be: Rose Finn Apple fingerlings, green peppers, rainbow carrots, eggplant, summer squash, cucumbers, lettuce, yellow onions, kale, broccoli and cauliflower (for those who did not receive it last week). Premium shares will get choice of a green radicchio or dandelion greens and choice of an herb. (Note: Downtown Harvest CSA is a Premium Share CSA). Posted 7/10/2017 9:13pm by Jeff Schrimmer. So it’s been a wet season thus far and it seems that this weather pattern will continue into the normally dry month of July. We have received 5 inches of rain in the past 2 weeks, when we normally hope for an inch a week. This is not bad for most of the crops but it is a little worrisome for the tomatoes and the cucurbits (squash, melons and cukes) which are susceptible to fungal diseases. We are doing our best to keep them sprayed with protective organic remedies such as biologicals, oils, garlic and kelp. Let’s hope the rain eases up a bit soon! Eggplant is beginning to come in but in small quantities; some groups may receive some this week and others next week. We have run out of kohlrabi, so if you did not get any and you really like it (that would be about 3 of you lol) we will try to make it up to you it the fall when we will have another crop. We know who you are and (approximately) where you live! Fortunately the broccoli is about to abound and a few of you will get cauliflower this week. The rest of you will have to wait your turn. We’re back to beets in the root category this week and we have basil enough for all including some Thai and lemon types. The share for this week will be: lettuce, peas, broccoli, beets, kale, chard, red onions, summer squash, cucumbers and basil. Possibly eggplant and possibly cauliflower. Premium members will get a second lettuce and another herb. Circle Brook Farm egg shares are now available! Posted 7/10/2017 7:10pm by Jeff Schrimmer. We are pleased to announce that we will now be offering an egg share. This past spring we built a “chicken tractor”- a mobile chicken coop used for raising birds on pasture. We acquired a flock of laying hens; Rhode Island Red crosses. The birds are now beginning to lay and the flock will soon be in full production. The birds are outside all day, where they feed on the grass and other plants and insects as well as the vegetable wastes which the farm generates. The birds spend the night on roosts inside the chicken tractor protected from predators. Their foraging diet is supplemented with milled grain that is locally sourced and non GMO. We have not been able to find a nearby source of organic feed in the quantities we require. The cost of the share will be $85 for the remainder of the season (18 weeks) and we will begin deliveries the week of July 16th. This is for one dozen each week; if you need more than a dozen you may buy multiple shares. We need to give Farmer John an accurate count of how many eggs to deliver this week. 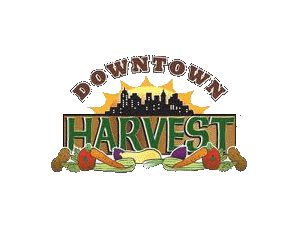 If you wish to purchase a trial dozen eggs for $5 on Wednesday or take home a dozen free eggs on Wednesday by paying for the 18 weeks that will start Wednesday July 19, please e-mail us at downtownharvestcsajc@gmail.com by Tuesday evening. The eggs will be brought to our pick-up site in coolers, and Farmer John is planning to be there to meet members and answer questions. Posted 7/4/2017 3:33pm by Jeff Schrimmer. Hi everyone, Happy Fourth of July! We have a wonderful share for you this week. The peas continue to come in and we have carrots; peas and carrots just like my mom served us out of a can (not!). Also new for this week are cucumbers; we have some Kirby (pickle type), English (long slender, burpless and mostly seedless) and some regular slicers. You will get some of each type in the coming weeks. The share for this week will be: Lettuce (2 heads for premium shares), kale, carrots, Swiss chard, peas, summer squash, broccoli or kohlrabi or Napa cabbage, cucumbers, and sweet onions. Fennel and an herb for the premium shares. Posted 6/26/2017 10:51pm by Jeff Schrimmer. We received some good rain last Friday evening and overnight into Saturday, but it cleared off early Saturday, giving us a beautiful day for the farm visit picnic. Attendance was a bit low but those who came out had a nice time. I hope many of you will have a chance to visit sometime this season. I enjoy meeting the members, especially the children. As I have previously mentioned, I was raised on canned vegetables so it’s wonderful to hear about how the kids enjoy fresh veggies. We should have had Napa cabbage for everyone this week, but the high humidity combined with the heat wave caused many to succumb to bottom rot. We have another planting that will be ready soon, so we will distribute what we have for now and some will have to wait a couple of weeks. The broccoli is starting to head up so those who do not get cabbage may get broccoli or kohlrabi. I was hoping to have carrots for you this week but they are still a little small, so we will wait until next week for them to size up a bit. Summer squash is coming in heavy now so expect lots! The share for this week will be Lettuce, choice of Swiss chard or spinach, kale , summer squash, peas (mainly Sugarsnap), scallions, Napa cabbage or broccoli or kohlrabi and choice of an herb (parsley, chervil, sweet marjoram, summer savory) and endive (frissee) for the premium shares. Posted 6/21/2017 9:47pm by Jeff Schrimmer. Hello members, We look forward to visiting John's farm this Saturday. Members of the Core group will be there, and we hope you can join us. Farm Visit- June 24th and 25th - 11:00 AM. Saturday 6/24 will be the main day for CSA members with Sunday as a rain date and for anyone who cannot make it on Saturday. This will be a potluck picnic, please bring a vegetarian dish to share with others. Grills will be available for anything you wish to bring to cook. There will be tours of the fields at 11:30 am and 2 pm. There is a u-pick strawberry farm just north on Rt. 206 if anyone would like pick strawberries for themselves before or after the event. Volunteers are welcome to help with set up, parking and to pick strawberries for a shortcake desert. Volunteer days- Sundays - Meet at 141 Brighton Rd., Andover, NJ Saturday, June 24 @ 9am and Sunday, June 26 @ 9 am -Help with pea picking. Sunday, July 2 @ 10 am – pea picking Sunday, July 9, 10 am - Help with the garlic harvest. Sunday, July 23 @10 am - Help with bean picking.